This was on the back on the van yesterday morning, before the sun came up and melted it. I emphasized the color a little, but it really looked like this. I put a layer of batting under the fabric to give the stitching more depth. I like the way that came out. 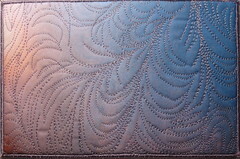 It looks a lot like classical feathered quilting, but it isn't - I really just followed the frost lines. I have posted the finished February journal page on Flickr. I finished both the pages I posted previously, one with a woven background and one with a simpler background. I liked the woven background better, and I think it is a stronger page, so that is the one I posted. Most of the people in class felt the same; although they liked the second page well enough, it seemed too plain, especially next to my January page which is well and truly filled with incident. I rode both Revy the Dim and Tiger Eye the Worried today. I had nice rides on both, though not so long because while it was the dead of winter last week with temps in the single digits fahrenheit, this week it is nearing room temperature outside. And everyone still has their winter coats on. Think of running around in your long underwear - we took it easy today. Everyone is shedding drifts of hair. The birdies will be happy with us, and build soft nests.